Scientists have a tremendous opportunity to improve access to and understanding of technical information in communities, leading to better solutions. Browse our resources on working with communities to learn about best practices for respectful, effective engagement. 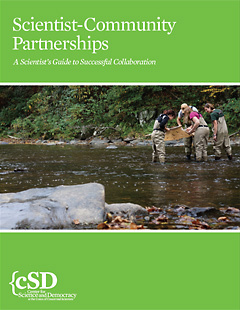 To help scientists engage more effectively in their communities, we've put together a 16-page guide that explains some of the benefits and challenges of community partnerships and offers specific advice for finding partnership opportunities, building relationships with community groups, and overcoming barriers to successful collaboration. Useful information from a variety of sources on building successful partnerships. UCS has produced a series of webinars and other videos offering insights from scientists and community members on how to build productive collaborations.